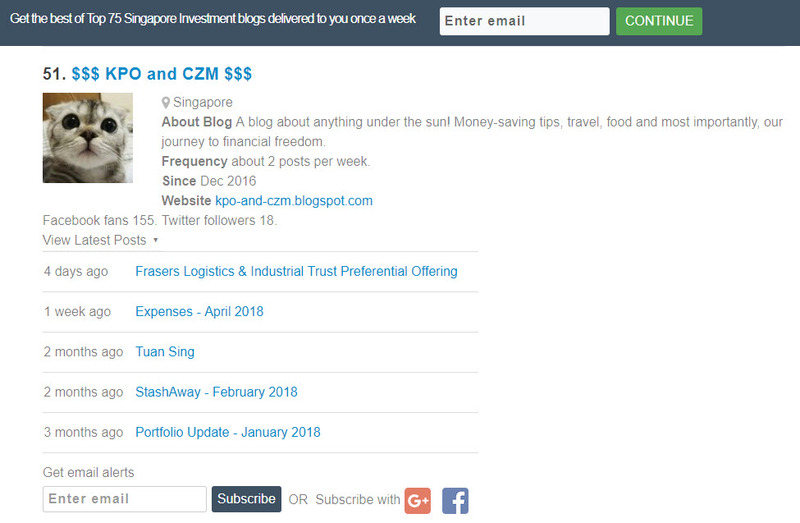 A few days ago, I received an email from Anuj Agarwal, the founder of Feedspot congratulating the KPO and CZM team (me, myself and I) for being selected as one of the Top 75 Singapore Investment Blogs. We would like to thank our parents readers for your support. This award would not have been possible without all of you! Since it is such a special day, let me share some interesting numbers and attempt to value our blog. How much do you think our blog is worth? I started placing advertisements on the blog around last year July. Till date, the blog has generated $473.54 in less than a year! For a few days/weeks in July, the blog was generating a few cents per day. Slowly it grew to 10/20 cents per day and now, about $1 on average per day. Once in a while, I will write something interesting such as this - DBS Multiplier + SSBs + Joint Account = Higher Interest! 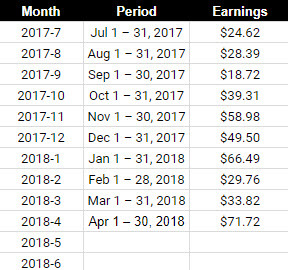 which generated ~$30 in 2 days (what I usually get in a month)! Let's assume that the blog will generate another $30 for June 2018, the annualized earnings will be around $503.54. 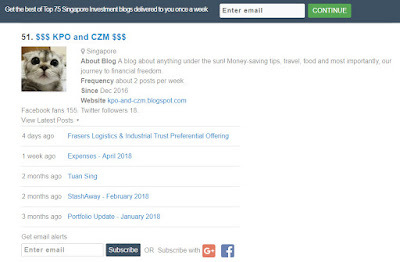 If our blog is similar to a stock paying 5% dividend, its market value would be $10,070.80! Wow! Who wants to buy? Hahahaha. On second thoughts, our blog is not for sale. It is on its way to becoming the next million dollar business. 老王卖瓜，自卖自夸 (lǎo wáng mài guā, zì mài zì kuā) Time to sleep and continue my dream! Hi, can you share how to place an add on the blog. I can’t seem to add Google Adsense on my blog. Maybe bcos is all photo without words? Yes, you need some content/words in the blog for Google to index it accordingly. Just apply and submit your blog URL to Adsense and they will evaluate and notify you after a while if you can place ads on your blog.